Most companies have very clear organisational aims and objectives, but these do not always include the use of digital technologies as an integral element or as a strategic enabler. Formulating a digital strategy is critical as it provides a reference point for investment decisions and the associated expected outcomes. ThinkDigital™ is Arrk’s methodology for rapidly conceiving and developing practical digital strategies establishing a common understanding amongst senior people as to the vision and objectives for the digital programme.  Whilst having standalone value, the outcomes from ThinkDigital™ have been designed to dovetail seamlessly into our Design delivery phase. Our EmbArrk™ methodology sharpens the focus on IT development projects, providing a rapid understanding and confirmation of organisation’s problems and looks to establish user requirements to allow group brainstorming sessions to build consensus. Depending on the scope of the project the EmbArrk™ can encompass the creation of custom, systematic solution roadmap, comprising business case, user stories, technical design, wireframes and provisional release plan. We focus on getting innovative software into the hands of users as fast as possible. By shrinking time to market and embracing change, we ensure you can respond rapidly to market changes and sustain competitive advantage. With our Agile@Arrk™ development methodology, we combine flexible software engineering practices and expertise in leading technology with a value-driven pragmatism and deliver as fast as possible using our distributed development teams. Our approach ensures we deliver on time and with the highest levels of quality and predictability and we build long-lasting, flexible applications. Technology and the business environment are the two of the fastest changing elements of our world. It is increasingly important to make sure that your business always takes advantage of the very best that your software has to provide and that your software continues to match the business demands of the time. Our Application Support Management (ASM) service ensures that through regular updates and maintenance you will keep up with market trends and guarantees your business is as reliable and efficient as it can be.